Problems can usually be held to a minimum by assignment of qualified, trained personnel to the position of construction inspector. On larger grading projects it is, wherever possible, good to train new technicians under the supervision of the construction inspector to perform the mechanical tests and assist in compaction inspection. The inspector should obtain the contractor's grading plan of operation. The inspector should then immediately run enough standard compaction tests covering materials in the area where work will start to replace those furnished by the district soils and geology technologist. The inspector should also determine moisture content of the soil in its natural state throughout the area where the contractor plans to start grading. Records regarding amount and disposition of salvageable materials. The person making each diary entry must sign it. Measurements and notes to substantiate classification and quantity of the various materials encountered in the excavation. Measurements and notes to document amount and reasons for undergrading and cut compaction. The following information outlines the areas of responsibility of the construction inspector. This "checklist" should be used as a reminder. Limits of clearing and grubbing are marked. Items to be replaced, such as survey corners, lot corners, historical markers, etc., tied out. Clearing and grubbing units taken, documented in a field book, and checked and signed by contractor, or quantities furnished him. Before starting an embankment, the location of the work should be clearly outlined by construction stakes. Control stakes set (cut and fill) and understood by all. Documentation record issued explaining how stakes were set. Stakes that are disturbed or destroyed should be immediately reset. Borrow areas and estimated excavation cross-sectioned. Foundation where fills are to be constructed given a thorough inspection. Soil survey in field laboratory with soils identified and compaction standards run on each type and/or horizon of soil. Satisfactory field laboratory with proper testing equipment and materials on site. Plans and special provisions for any special equipment or construction procedures reviewed. Payment diary with method of measurement for each bid item to be encountered and method of documentation (review the specifications and engineering guidance). Observe for condition and type of soil being excavated. Watch for classification changes in materials. Watch for overload equipment around drainage structures. The inspector should see that the contractor has the proper permits, where necessary, for hauling over or across existing pavements or structures. Ensure proper lift thicknesses are distributed uniformly over the full width of roadway. Require clods to be broken up on embankment areas to minimize excessive voids or a scabbing effect produced by mashed clods. Ensure the fill is continuous leveled and manipulated to ensure uniform density. Observe proper signing, flagging, erosion control, etc. are being performed. Observe number of passes of approved compactive equipment on rock fill. Ensure proper benching techniques are performed when slopes are widened or fills are tied into steep terrain to prevent future slope or grade failure. Require density to meet minimum requirements of the specifications. Keep in mind that specifications may require a different density at bridge ends and for the top portion of embankments under flexible pavement, from that on remainder of the roadway. When specified, require compactive effort is performed when material is at proper moisture content. If material is too wet or too dry, the contractor may correct a wet condition by aerating the material by disking or other means. If the soil is too dry, water may be added at the borrow site or cut areas before excavating. This reduces the manipulation necessary to obtain uniform distribution. A stable grade is essential and it can be secured only if adequate attention is given to surface drainage. Water pockets create soft or spongy spots in the subgrade and unfit for pavement. Inspect the rolling operation. If the subgrade is pumping, cracking or is showing other signs of failure, determine the magnitude of the failure and take corrective action to address the problem. Rutting will produce areas in deficient thickness and will result in a poorly drained subgrade. Perform the necessary number of field density tests daily to document the quality of the grade. Obtain density tests in structure backfill. Require roadway surface to be kept properly shaped and drained. Document density checks, thickness lifts, roadway template checks, and any special instructions given to the contractor. Roadway and drainage excavation is the material obtained from within the right of way, and from easements for channel revisions or from borrow. Materials include common earth, solid rock, detached boulders, or a combination of these materials (unclassified). It is used to construct embankments to required grade, line and typical section. Prior to beginning excavation and embankment operations in any area, all necessary clearing, grubbing and stripping in that area shall have been performed as specified in Sec 201. Excavated material is usually classified according to its structural characteristics. Excavation classes are grouped by geologic definitions and not by excavation methods. When the contract specifies classified excavation, the ordinary classifications will be Class A, Class C or Unclassified Excavation. Precise records must be kept on a project with more than one class of excavation as separate pay items. Changes from one classification to another must be noted. Sufficient measurements must be taken to establish correct pay quantities for each classification. When lines of demarcation are clearly defined, the usual method of measurement is to take cross sections along these lines. Formations of large boulders, intermittent ledges that are not well defined, and some irregular types of pinnacle rock may be encountered which make it impractical to establish lines of demarcation. It then becomes necessary to classify material on a percentage basis. In such cases, cross sections should be taken along the upper limits of the material in question. While material under consideration is actually being removed, the resident engineer should study it jointly with the district geologist and the contractor's representative to reach agreement on the classification percentage to be used. Lateral limits of questionable classification should also be established. Divide the cut into smaller areas both longitudinally and transversely for separate consideration, if classification percentage varies appreciably through the cut. Elevations or cross sections, and longitudinal limits must be taken to establish each volume of varying percentage. After agreement is reached on the percentage of each classification, the contractor should be given a written copy of the agreement as a matter of record. The geologic definitions for determining proper classification of Class A are defined in Sec 203. One of the more difficult materials to classify is chert. Sec 203.2 should be carefully reviewed before classifying chert as either Class A or Class C.
Geologic definition for determining proper classification of Class C is defined in Sec 203. Care must be taken to avoid confusing Class C excavation with shale, fire clay, or similar materials, all of which are considered Class A Excavation. On some projects no attempt is made to classify excavation and bids are taken on the basis of Unclassified Excavation. All material excavated will be considered Unclassified Excavation unless the contract specifies classified material. Work will consist of excavation of all materials encountered regardless of their nature or the manner in which they must be removed. Unclassified excavation requires the same measurements for the determination of final quantities as classified material. If the roadway profile, slopes or berm elevations are changed in an unclassified cut, cross sections should be taken and a revised quantity computed. An effort is made on most jobs to design for the "cut" and "fill" to balance. For many reasons there may not be enough suitable roadway excavation, together with excess channel and structure excavation, to complete the embankment to required section and grade. When this occurs, borrow excavation must be obtained to make up the difference. Borrow is of approved material classified in the same manner as roadway excavation. It is to be obtained from borrow areas shown on the plans or from other areas designated or approved by the engineer. Before the contractor moves material from a borrow area, cross sections or measurements must be taken that the volume moved can be computed. Use of borrow from areas other than those shown on the plans or designated by the engineer should be approved only if the material is equally satisfactory, if all requirements for substitution specified in Sec 203 are met, and if the substitution is in the best interest of the Commission. Proposed alternate borrow sites will require environmental clearances if the site had not been previously approved. Reference to cost of easements includes those acquired by MoDOT as well as those the contractor may acquire. The Right of Way Division acquires easements required for construction of the project. However, since they are acquired to provide a construction material, they are charged as a construction cost. On federal-aid projects no federal participation can be expected, if they are not used. MoDOT could, therefore, suffer a monetary loss due to the contractor's substitution. If the easement is used on federal aid work, MoDOT pays for a borrow easement and pays bid prices for excavation incorporated in the project. MoDOT receives federal participation in the cost of both items. If the easement is not used, MoDOT’s payments are the same as in the previous case, but the federal participation is limited to the costs involved in the actual excavation. The Division of Construction and Materials should be contacted about the costs to be recovered before borrow substitutions are approved. All borrow areas shall be bladed and left in such a shape as to permit taking the necessary cross sections after excavating has been completed. The finished borrow areas shall be approximately true to line and grade if so specified in the contract, and shall be finished, where practical, such that no water will collect or stand therein. MoDOT expects the contractor to conduct their activities in a professional manner. Property owners often look to MoDOT to correct any damages created and left by the contractor. For this reason the contractor must obtain a written release from the property owner to document that the owner suffered no damage. Proposed alternate borrow sites will require environmental clearances if the site had not been previously approved. At the preconstruction conference, the project's environmental issues are discussed (refer to EPG 105 Control of Work). Normally it will be the inspector’s responsibility to enforce the requirements of MoDOT's Storm Water Permit obtained from DNR. The inspector should also be alert to any developing problems, which could lead to stream polluting. If such problems are detected, they should be brought to the attention of the contractor and the resident engineer and adjustments made to correct the problem. The contractor is required to submit, at or prior to the preconstruction conference, a proposed schedule (plan) for implementing the temporary and permanent erosion control work. The proposed implementation plan should be in sufficient detail to assure the department that permanent erosion control features will be constructed at the earliest possible time and that adequate temporary controls will be used during the period of actual construction. No work is to begin until the erosion and pollution control measures are reviewed and accepted by the resident engineer. The contractor's schedule must address borrow areas, staging areas, storage locations and handling of petroleum products and other pollutants, temporary pollution and erosion control measures for all staged and completed construction operations. If stage construction is expected on the project, a separate erosion control plan is usually developed for each stage. The erosion control plan addresses methods to intercept the sediment before it enters crossroad drainage. Temporary erosion control measures are not to be placed in natural drainage or streams. The plan must include measures for the control of both sheet and gully erosion for the project and borrow areas. The erosion control plans should indicate the right of way limits including temporary and permanent easements and construction limits. All permanent drainage structures and temporary erosion control features are shown. Additional erosion control guidelines are available. The wetland specialist from Design and the liaison engineers in Construction and Bridge are available for guidance to address stream crossings or to assist with marginal or questionable proposals. It is not practical or economical to provide temporary erosion control measures through cuts when grading operations are active. In cases where the contractor operations would conflict with erosion control items, sediment containment measures must be concentrated where the soil-laden runoff from the cut area leaves the right-of-way (especially at equipment crossings and bridge projects). The main objective is to keep project sediment from leaving the project. The resident engineer will limit the amount of surface area of erodible earth material exposed at one time due to excavation, borrow fill within the project, contractor furnished borrow and excess material disposal site. The resident engineer may further limit the area commensurate with the contractor's capability, history of performance and progress of permanent erosion control measures. Specifications limit the surface area of erodible earth material exposed at one time to 10 acres within any individual drainage area without installation of erosion controls for that drainage. The total surface area exposed at one time for the entire project shall not exceed 17 acres without the written approval of the engineer. Specifications allow the engineer to increase or decrease the amount of surface area of erodible earth material to be exposed at one time. Documentation is necessary to increase the allowable open acreage. In order to complete projects in a timely manner and to reduce the time the project grade is susceptible to erosion, it makes sense to allow the contractor some flexibility to open additional acreage beyond the above stated square feet requirements. Depending on the resources a contractor is willing to commit to the project, additional area can be authorized for each grading spread a contractor has active. An effective grading operation must also include equipment to finish the grade. Before additional areas are increased the resident engineer must be satisfied that the contractor is installing temporary erosion controls before 435,000 square feet are opened and is finishing grade and installing permanent erosion controls before 750,000 square feet per spread are exceeded. As the contractor removes equipment from the job, the authorized acreage must also be decreased. The controls on exposure of erodible soil are intended to apply to normal operations. The use of small crews at several locations should not be allowed to serve as a means of enlarging the permissible exposed area. In calculating the 17 acres of allowable erodible area, any area not susceptible to erosion, such as, rock fills or cuts, rock slopes, paved or rock lined ditches, base or roadway pavement, seeded or sodded surfaces could be excluded from the total. Simply removing trees do not necessarily add an area to the total allotted 750,000 square feet of erodible area. If sod is present after clearing is completed, the area need not be included. Placement of temporary erosion control measures, i.e. ditch checks, sediment basins or silt fence do not allow additional erodible area in excess of the 750,000 square feet maximum. If the authorized acreage exceeds the specified limits, written documentation is required to justify the excess. Often the contractor will want to clear and grub the entire project. The contractor is limited to the acreage authorized by the resident engineer. Areas with ground cover do not count towards the erodible acreage allowed. The contractor may, at his expense, apply temporary seed to obtain the necessary ground cover and, once vegetation is to the specified plant density, clearing can proceed. If the area is to sit idle for an extended time frame, mulch should also be applied with the seed. Before seasonal discontinuance of project operations, erodible areas are to be seeded. Weekly erosion inspections are required by MoDOT's DNR Storm Water permit. Be familiar with the permit conditions. Copies of the weekly erosion inspections, the permit and the Storm Water Pollution Prevention Plan (SWPPP) should be maintained in a folder for easy future reference. Permit require land disturbance sites to be inspected on a regular schedule and within a reasonable time period (not to exceed 72 hours) following heavy rains. Regularly scheduled inspections are to be at a minimum once per week. Project erosion inspections should be scheduled with the project superintendent and documented. Particular attention to the erosion control items in areas where drainage leaves the project (especially around bridge structures). For disturbed areas that have not been finally stabilized, all installed BMPs (Best Management Practices) and other pollution control measures are to be inspected for proper installation, operation and maintenance. Locations where storm water leaves the site are inspected for evidence of erosion or sediment deposition. Any deficiencies noted during a weekly inspection shall be corrected with seven calendar days of that inspection. The results of the weekly inspections in a given month are recorded in that month's report. Notice of deficiencies is given to the contractor responsible for operation and maintenance of BMPs. A listing of areas where land disturbance operation have permanently or temporarily stopped. The person performing the inspection signs the report. It is recommended a diary be utilized to document erosion control inspection, inspection findings and instructions given to the contractor. The logbook should contain all relevant documentation relating to erosion control for easy reference. It would be advantageous to document payments for erosion control items on the project, documentation records and order records issued regarding erosion control. The authorization date for areas to be opened should be shown with a corresponding date the areas are permanently seeded or are no longer considered erodible. A running log of the open erodible acreage inspection records can be maintained in this diary. Documentation records at the erosion control benchmark dates for evaluating contractor performance should also be maintained in this diary. If an enforcement inspector observes a violation of our agreement with them, the inspector should notify the resident engineer describing the type and location of the violation and giving a time frame for correcting the violation. The resident engineer will have the deficiency corrected within the specified time frame, usually within 7 calendar days. The resident engineer will fully document the meeting with the inspector. The resident engineer should videotape the location of the violation before and after corrective action is taken. Notify Division of Construction immediately of any Notice of Violation (NOV) issued by the Department of Natural Resources (DNR) or of any inspection from the Environmental Protection Agency. This guidance has been developed for district personnel who may be collecting the required samples. It is intended to provide a consistent approach for choosing sample sites, collecting samples, performing the necessary tests, and reporting test results. a. Choose 3 representative sample collection locations. Identify three different locations on your selected project site where you will be able to collect a sample of runoff water during a rainfall event. Since the primary purpose of our water sampling is to verify the effectiveness of our erosion control practices or structures, it is important to locate your sample collection stations downgrade from a series of silt fences, straw bale dams, detention ponds or combination of these. Remember, it will be muddy when you are sampling, so keep convenience in mind when you consider your sample collection points. b. Construct sample collection point. Before you collect any runoff samples, you will need to identify or create a situation whereby you can grab a representative sample of water flowing away from the erosion controls with a wide-mouthed sample jar. It will be best to locate your sample collection point at a box culvert, drop inlet, or ditch check. The critical element is to insure that you are grabbing a sample that is representative of that water which is leaving the site. c. Diagram your three sample locations. Develop a simple sketch that describes the basics of your sample location. Show the direction of flow, the locations of check dams, silt fences, etc, and the sample collection point. This may need to be modified as construction proceeds, and will ultimately be included with your sample results. This sketch will be of value in the eventual interpretation of the test results and may help to identify the most effective erosion controls. e. Collect samples. During a rainfall event that is of sufficient duration or intensity to cause runoff, use the wide mouth mason jars to grab a sample from each of your three sampling points. Again, you are attempting to collect a representative sample of the runoff water. Make sure you completely fill your quart sample collection jar because the test that you will perform back at your project office requires one quart of water. Make certain that you identify each jar according to its specific sample location. This can be done with a magic marker on the lid, a prepared label taped to the jar or any other means by which you can keep your samples straight. This is important because some erosion controls may be more effective than others and we will want to carefully document these differences. f. Record appropriate rainfall intensity information. Note as much information about the intensity, duration, and accumulation of the specific rainfall event. This information is necessary to correctly evaluate our sample results. Installation of rain gauges is not necessary as the type of information that we seek should be readily available from local radio stations, newspapers, local ASCS office or other sources. g. Perform the test for settleable solids. The attached methodology is taken from "Standard Methods for the Examination of Waters and Wastewaters". Note that there are two different methods. Use procedure 209 E. 3a, the volumetric method. You will use the three Imhoff cones and the cone rack that were provided to you. h. Record your results. If you collected samples on different days use a different page for each day. i. Mail in your results. Attach a copy of your site sketch(s) to your sample results and send them to the Construction and Materials Division. Keep a copy in your project file. The entire effort to achieve compliance with our permits should not fall on the construction inspector. The contractor is required to submit an erosion control plan at the preconstruction conference. Compliance with contract requirements is the contractor's responsibility. Currently the contractor performance rating evaluates the contractor's erosion control efforts at quarterly benchmark dates of January 1st, April 1st, June 1st, and September 1st. At the preconstruction conference, a contractor contact should be provided as a point of contact for erosion control matters. The individual should be included in the DNR inspections and erosion control benchmark date inspections. If deficiencies is noted from a weekly inspection or if a DNR letter of warning is received, written notice would be given to the prime to correct the deficiencies within a specified time frame, usually a calendar week. The failure to comply with the written instructions would result in an order record with a second deadline date for compliance. If an order record is necessary, it is recommended 10% of all grading quantities for unfinished grades and 5% for any non-seeded finished areas be withheld from the pay estimate and not paid until the seeded areas are accepted. Failure to meet that date would result in a second order record with a notice to cease and desist all operations other than operations to bring the contract into compliance with our erosion control permit. Failure to meet the second deadline would also be grounds for the resident engineer to hire a contractor to correct the deficiencies. The cost to correct the deficiencies would be subtracted from the project's pay estimate. Documentation for evaluating contractor performance must include the open and authorized acreage and the proper maintenance of temporary erosion control items. The documentation should reflect the number of items currently required on the project compared to the number of items properly installed and maintained. For example; if the project currently requires 24 Type II ditch checks and the contractor has only 12 installed and of the 12 in place only 50% are properly maintained, the contractor would have 25% of the contract value for 24 Type II ditch checks applicable to his performance rating. If sediment buildup is more than 50% of the height of the check, then the ditch check isn't being properly maintained. The same reasoning would be applied to Type I ditch checks, slope drains, silt fence, sediment basins, etc. Each project's erodible acreage information must be updated in SiteManager and AASHTOWare when weekly erosion control inspections are conducted as outlined in the Storm Water Database Initial Setup QRG. If a project has zero acreage erodible, please enter a zero, "0", in the field. Erodible acreage should be verified prior to generation of contractor pay estimates to ensure accurate information is provided. This information is important as it is used to generate the DNR erodible acreage quarterly report. A blank field will result with the project being listed in the report. Acreages must be zeroed out in SiteManager and AASHTOWare once final stabilization has been achieved to ensure projects are no longer listed in the DNR report. Constructing earthwork to reasonably neat and uniform lines is desirable for all phases of earthwork construction including channels, roadway ditches, and other such features. The task of finishing earthwork can be held to a minimum, better construction will result and erosion is minimized if every reasonable effort is made during excavation of cuts and construction of embankments to finish slopes, shoulders and ditches as work progresses. It is impractical to trim rock slopes to exact cross section; however, any dangerous or objectionable appearing projections or loosened boulders should be removed and the slope made as uniform as possible. Finished earthwork should have a pleasing contour and be reasonably smooth in all respects. Tops and bottoms of slopes should be rounded where shown on typical sections. Rounding improves appearance and helps reduce erosion. Transitions in slope and warping to fit special or unusual features within the roadway should be gradual. Abrupt changes of slope at the intersection of cuts and fills should be avoided. Class A subgrade has a tolerance of + / - ½” as required by Sec 209.2.1. 2. Class C subgrade is to be 2 inches low with the top 2 inches backfilled with material meeting the requirements of Sec 203.4.4.2.1 to the established template with a tolerance of 0.1 feet. The construction of shoulders shall start when sufficient surfacing has been completed and the surfacing has attained satisfactory strength to permit continuous shouldering operations. Equipment that will damage the surfacing will be prohibited from operating on the surfacing during shouldering operations. Surfacing and curbs shall be protected where equipment is crossing or turning. The engineer may order the contractor to remove oversize material if the upper 4 inches of the subgrade, as tentatively completed, contains loose rock over 2 inches in size to make the subgrade unacceptable as a roadbed for the proposed type of surfacing in the judgment of the engineer. Rock excavation must be broken down to satisfactory sizes for removal from the excavation and incorporation into embankments. Blasting should always be done under competent, careful supervision to prevent injury to persons or damage to adjacent property. The resident engineer must ensure the contractor complies with the requirements of Sec 107.7 regarding the use of explosives and blaster certification requirements. The contractor must submit a blasting plan to address the requirements of Sec 203.4.4.1.1. Spacing and depth of drill holes, type of explosive, loading sequence, methods of firing, and related matters are items to be determined by blasting experts. Each of these items depends on local rock conditions and production equipment to be used. Spacing and strength of blasting charges should be such that the actual blast is as light as possible consistent with thorough rock breakage and reduction in size. Overshooting is very undesirable. It can produce rock fractures beyond the intended line and grade that result in jagged slopes, uneven ditch grades, and possible future slides in the slope area. Blasting should produce specification material while leaving the "cut" area at the correct line and grade. Good blasting technique can materially lower the contractor's cost by producing specification material under relatively safe conditions. Poor blasting technique is not only dangerous, but it can cause excess over-breakage, or it can fail to shatter the material enough for economical handling and placement, thereby requiring additional drilling and shooting. In deep cuts through difficult material where slope smoothness is hard to obtain it can be advantageous to drill holes parallel to the proposed roadway slope. In these holes the charge is distributed along the length of the hole instead of placing it all at the bottom. The portions of the charge are then exploded simultaneously. This method, known as "presplitting", is not intended to loosen and break up an appreciable quantity of rock. It is intended instead to shear the rock in a reasonably smooth plane along the proposed slope face. The rest of the rock in the cut is then shot and removed in the manner best suited to the material involved. The contractor must backfill undergraded the area areas with rock spalls or other acceptable granular material. The approximately top 2" of the rock grade is to be finished with rock fragments, spalls, or granular base to provide a surface that can be autograded. This issue is important if a subsequent project provides for the paving. Large material left in the subgrade can create additional work and expense for the department if this requirement is not properly performed. Excess overbreakage is not only undesirable from an appearance standpoint but is very costly to the contractor, since he receives no pay for material excavated beyond design slope limits. All additional excavation, hauling, and disposal expense caused by overbreakage must be borne by the contractor. Special care should be taken in blasting immediately adjacent to proposed slopes or ditch lines. Unsuitable material is defined as material that will adversely affect stability of the completed roadbed. It may be material with high organic content, exceedingly high moisture content, excessive P.I., etc., or it may be unsuitable only for a particular location in the roadbed template. Normal construction processes can correct some conditions that render material unsuitable. For example, high moisture content can, in many soils, be reduced by aeration and manipulation. Materials that cannot be rendered satisfactory by manipulation create problems for inspecting personnel. When such material is encountered above grade in cuts, disposition should be as directed by the resident engineer, unless a reasonable method of treatment is available to make it satisfactory. In some cases, material may be of a type that can be used in the bottom of high fills without affecting the ultimate stability of the roadbed, in other cases disposition of the material should be outside roadbed limits as discussed in Sec 203.6. When the contract provides for borrow from both a future roadway and a borrow area, roadway excavation must be completed first before excavating from borrow areas. Project borrow sites must be utilized prior to excavating contractor provided borrow areas. Should the contractor proceed to excavate in designated or provided area before completing excavation from the roadway, the contractor should be advised by order record that such action is being done at his own risk and expense. If excess material must be restored to the borrow area, it shall be returned at the contractor's expense. The contractor shall not excavate beyond the dimensions and elevations established, and no material shall be removed prior to staking and cross sectioning the site. Borrow quantities are not to be finaled until all grading is completed. If the contractor places more borrow than required, thereby causing a waste of excavation, such waste will be deducted from the borrow volume. If it is necessary to remove fencing in order to obtain borrow material, the fencing shall be replaced in as good condition as the fencing was at the time of removal. The contractor shall be responsible for confining livestock when a portion of the fence is removed. Removing and replacing such a fence or the confining of livestock shall be at the contractor’s expense. In some areas where a scarcity of suitable material is anticipated for constructing top portions of embankments and backfilling undergraded areas, the plans may show certain material available from roadway excavation to be stockpiled for future use. If there is any doubt about suitability of material proposed for such purposes, the resident engineer should contact the District Construction and Materials engineer for advice. The district soils and geology technologist may also be consulted and may wish to test the proposed material. Stockpile sites should be selected which will minimize the haul involved without interference or delay to other construction operations. Uneven riding surfaces may result from non-uniform soil types or from variations in moisture and density during construction. These conditions cause variable initial strength. They also cause uneven responses to moisture change in the form of swell or shrink. They may lead to changes in strength as a result of the non-uniform responses, all because of climatic effects such as periods of excessive rainfall or drought, and of freezing and thawing. To guard against these undesirable effects, proper blending of materials is essential. The use of discs, plows, blade graders, or similar equipment will usually accomplish the desired result. The less desirable materials should, whenever feasible, be used in the lower portion of the higher embankments. Selection of equipment used to haul and spread embankment material is the contractor's option. However, he should not be permitted to operate equipment of such weight or in such manner that it will damage any completed work. All ditches, including inlet and outlet ditches, shall be cut to grades that will properly drain. The required cross section for inlet and outlet ditches leading to or from structures shall be of a width no less than the width of the structure. Broken up portland cement concrete, asphaltic concrete, bituminous pavement, rock, gravel, sand, uncontaminated soil, cinder blocks and brick are considered to be clean fill. Asphaltic concrete and bituminous pavement is considered clean fill only when used above the ordinary high water mark of a stream. Disposal of these materials will be in accordance with Construction Inspection Guidance for Sec 202. The inspector should ensure the contractor spreads his hauling units over the full width of the grade while hauling to and returning from the embankment area. By distributing movement of units, compactive effort is applied by hauling units, deep rutting is minimized, and compacting time of tampers and rollers is reduced. The inspector should acquaint himself with the compaction equipment to be certain adequate compactive effort is being exerted since it will be physically impossible in some cases to obtain a density test on each lift. This also applies to compactive effort around structures and on the edges of embankments. Layers of embankment may not be built of frozen material. Neither may layers of embankment be placed on foundation soil that has frost penetration in excess of 0.2 foot except under specific conditions defined in Sec 203. When constructing embankments on steep slopes, particular attention must be given to obtaining a good interlock between the sloping foundation and new embankment. Every effort must be made to prevent formation of slippage planes. This usually requires removal of all vegetation, plowing of hard surface areas, and benching, in accordance with Sec 203. This "benching" is required when constructing a new embankment against existing ground which has a slope steeper than 6:1. Each horizontal cut for the bench must begin at the intersection of the ground line and the vertical side of the previous bench. The bench must be wide enough to permit placing and compacting operations. Benches are required to have a minimum rise of 12 inches. This method of keying new embankment to the surface of foundation material should also be used when widening and/or raising the grade of old embankments. Stumps, roots, rubbish or any other deleterious material shall not be placed in embankments. Where an embankment less than 2 feet high is to be constructed, all vegetative matter shall be cut and removed from the surface upon which the embankment is to be placed. The cutover surface shall be thoroughly broken. As excavation proceeds, material with characteristics entirely different from those anticipated by the designer may be encountered. This can lead to a change in shrinkage factors resulting with surplus material that must be disposed. Unsuitable material as mentioned in Sec 203.3 may also have to be disposed. Anytime it becomes apparent that excessive disposal of material will occur, the District Construction and Materials Engineer, should be immediately consulted. It is possible that a change in grade can reduce, if not entirely eliminate, excess material. If excess material cannot be eliminated, it can usually be deposited along fill slopes by creating berms. Before such berms are constructed, special attention should be given to right of way limits and to the effect berms will have on drainage in the area. As larger and larger hauling equipment becomes available, embankments are being built more rapidly. This means that roads are being completed and opened to traffic in shorter construction time. In most cases the surface course is placed on the embankment before any appreciable natural consolidation can occur. This makes it essential to obtain the best product possible during the construction stage. With increased speed in roadway construction it is imperative that the inspector be alert and aggressive to see that material is properly spread and compacted. Performing standard compaction tests and density tests must be speeded up as much as possible without sacrificing accuracy. This requires the inspector to become proficient in inspection and testing techniques. To obtain proper densities; depth of lifts, moisture content, and application of compactive effort must be carefully controlled within the framework of specifications. In addition to necessary checks of compaction, it is the inspector's responsibility to see that embankments and cuts are kept properly shaped and drained. The inspector should constantly be alert for new horizons or soil types which may require additional standard compaction tests. If they appear the inspector should see that new standards are immediately determined and put to proper use. The purpose of compactive effort is to increase the strength of the earth structure or embankment. Density is a measure of this strength. It is expressed in terms of weight per unit volume, normally in pounds per cubic foot. If one is to inspect compaction work properly, several things must be kept in mind. The standard compaction test is based on the fact that at a certain moisture content called "optimum", soil grains may, under a given compactive effort, be forced into such close proximity that a maximum density is obtained. Results of laboratory tests, when properly charted and interpreted, indicate to a great extent the possibility for satisfactory use of the soils in actual construction work. Mr. R. R. Proctor devised a test to be used on earth fills and dams. Proctor's theory was that soils are composed of particles ranging in size from gravel, through sand, silt, and clay, to colloids. Resistance to granular rearrangement in a dry condition is high because of friction between the particles. By addition of successive increments of a lubricant (water in this instance) resistance can be reduced and gradually overcome. Movement of the particles is facilitated and it becomes possible to compress the mass by forcing the smaller soil grains into the voids between the larger ones. When the proper quantity of lubricating liquid is introduced, frictional resistance is reduced enough that the mass may be compressed into its densest form. At this one moisture content only, moisture is at its optimum, and the density, or weight per cubic foot, is the maximum obtainable by a given compactive effort. If compactive effort is increased at the same moisture content, density will also increase slightly. It is also apparent that the same density may be obtained at a lower moisture content by application of appreciably increased compactive effort. This is logical since the compactive effort as well as the lubricant is effective in overcoming frictional resistance of the particles. It is thus possible to obtain a greater density in the field (100% + compaction) than is determined to be the maximum by the standard laboratory test. This is possible if compactive equipment is of such weight that it exerts a greater pressure per unit area than is exerted during the test, or if there are more trips over the embankment than necessary to obtain the standard compaction. However, if compactive effort exceeds the shear resistance of the soil at the existing moisture content, deep rutting of the embankment will occur. This theory explains why optimum moisture is higher for clays than for silts. Clays are much finer grained than silts and being of a more plate like or flat, thin structure, they have an enormously greater surface area and area of particle contact per unit volume than the silts. The frictional resistance is, therefore, comparatively higher. It then follows that the finer soil the more lubricating liquid it takes to overcome frictional resistance and permit the soil particles to be rearranged in a manner that reduces the volume of voids. Temporary stability can be obtained in a soil mass by compactive efforts applied at a moisture content below optimum. Very little true consolidation occurs, however, because of frictional resistance between the comparatively dry soil particles. The voids ratio is quite high. Even temporary stability depends on retention of the moisture at a point near or below that at which the mass was compacted. If moisture content increases, particle rearrangement, temporary instability, and some degree of consolidation will occur. It is quite likely that if material is originally compacted at a low moisture content, complete consolidation can occur only after the material has been saturated and subsequently dried. Permanent stability depends on reducing voids to a minimum, which is a necessary condition for obtaining maximum density. The aim of compactive effort is to obtain the desired stability. This will occur at maximum dry weight per unit volume for a particular soil. Accurate determination of the optimum moisture point and precise control of compactive effort and moisture content in the field is the most practical method of achieving the desired stability. If a soil mass is compacted at optimum moisture content practically all of the consolidation occurs at the time of construction by reason of the combination of lubricating moisture and adequate compacting pressure. At any density (weight per cubic foot) below the maximum, with a given compactive effort there are two corresponding points on the density-moisture curve, one on each side of the optimum peak. Both points represent the same dry weight per cubic foot and the same voids ratio. Below the optimum moisture point, the voids are filled with air and water. Above the optimum moisture content, water has displaced most of the air causing a considerable reduction in stability. A curve in Figure 200.4 illustrates the relationship between moisture and density. The curve, for example, shows that a dry weight per cubic foot of 107.6 lbs. corresponds to moisture contents of 13.7% and 19.3%. Theoretically, it would be best to begin compaction operations at a moisture content slightly above optimum, and continue while evaporation reduces moisture through the optimum level. Clays should generally be compacted at optimum to about three percentage points above optimum to prevent detrimental volume changes from later absorption of water. The first lift (layer) should begin in the low areas, with the intent of eventually providing an embankment layer approximately parallel to finished grade. Embankments should be kept properly shaped and drained during construction. Pockets or holes that trap water on the surface should not be permitted. The importance of uniformity in embankment construction cannot be over emphasized. Uniformity of material, layer thickness, moisture content, and compactive effort are vital to proper embankment construction. Roadway embankment of earth materials that are to be compacted must be placed in layers (lifts). Thickness of each layer must not exceed 8 inches, loose measurement. Each layer must be compacted in accordance with the contract before the next layer is placed. Areas outside roadway limits such as fill in old channels, waste berms, etc., may be constructed in layers up to 12 inches thick, loose measurement. Such areas do not normally have specified density requirements, but must be compacted by distributed hauling. Rock embankment is considered to be that which is constructed of material resulting from excavation of Class C material or of unclassified excavation containing material predominantly rocky in nature. Embankment constructed of such material should be built in layers (lifts) extending over the full width of the roadway. The thickness of each layer should be governed by the average size of the larger rocks, but in no case may it exceed 24 inches. Rocks too large to be placed in a 24-inch layer must be reduced in size to permit placement in the embankment. Rock should not be dumped in place but should be distributed by blading or dozing. Spalls and smaller stone fragments should be left on the surface of each layer. To allow the final surface preparation to be completed by an autograder without the interference of larger rock, the top 2 inches of the grade shall be constructed as required in Sec 203.2.2. Good judgment is necessary to determine when material is too rocky to obtain density tests of any practical value. Generally, material having more than 20% retained on a 3/4" sieve will be considered too rocky for satisfactory density testing. A soil survey is made by the district soils and geology technologist identifies, classifies, and maps soil types by horizons, with sampling and complete testing of each type. A complete soil test report on each horizon together with moisture density curve points will accompany the soil survey report. These tests are a great help to the inspector. They furnish a guide for future standard compaction tests since they were made in the Central Laboratory under ideal conditions. The inspector should run field standards as soon as possible. The inspector should compare field results with the laboratory standard for detection of possible error. If the inspector is delayed in running his/her own standard, the inspector may temporarily use the laboratory standard for control of the work. However, such use should be kept to a minimum. It is preferred to use the inspector's standard, run under field conditions. Compaction is the processing and consolidating of embankment material, whether earth or rock. In earth embankment, soils must be compacted to densities that will provide adequate stability under conditions to which the finished highway will be subjected. The compaction inspector must realize that no set formulas, tables, or general stress analysis can be used in designing for soil conditions. Moisture content of the soil. Nature of the soil, its grain size and distribution, and physical properties. Type and amount of compactive effort. Compaction of an embankment develops the potential strength of the earth structure by improving bearing capacity, controlling shrinkage and swelling, and reducing permeability. Compaction is obtained in the field by hauling equipment and compacting rollers that impose pressure, impact vibration, and manipulation on the soil. Tests must be made on those jobs having specified density requirements, to check results obtained by the contractor’s compactive effort. Specified percent of moisture. This is the percent of moisture specified in the contract if moisture control is required. Insert a dash in this space if contract does not specify moisture control. Percent compaction specified. This is the percent compaction required by the contract for the particular area being tested. Remarks. Show corrective action taken for tests showing insufficient density. Indicate results that are retests, and make any other comments needed to explain results of tests, and to identify original test for which retest is made. Percent compaction of embankments. The percent compaction of embankments shall be determined to one decimal place and rounded off to a whole number for reporting. Only the end results (actual percent compaction) of the field density tests is to be rounded; the in-place weight per cubic foot, moisture content, etc. are to be determined and reported as shown in the examples. This report is to be made weekly between the beginning and ending of grading operations unless grading operations are suspended. In this case a notation should appear on the last active report that reports will be suspended until work is resumed. The first report after work is resumed should also carry a note to that effect to explain the gap in reports. All data pertaining to field density tests must be recorded in the Compaction Record Book over the signature of the tester. The original copy remains in the book. At the conclusion of the job the entire book is transmitted to the district office with the final plans to become a part of the permanent project record. The inspector has the responsibility to insure that the proper number of moisture density tests is made at the proper locations. Effort must be made to test each lift or if it is practicable, a minimum of four density tests per day for each active grading spread. Enough tests should be run to verify results if unstable materials or unusual conditions are encountered. On very small grading projects, the number of tests may be reduced to be consistent with the size of grading spread. It is desirable to make as many density tests as possible on each workday to provide proper documentation of results being obtained. Moisture-Density tests are performed using Troxler Moisture-Density Gauges. The Nuclear Moisture-Density gauges provide moisture and density measurements in a much shorter time than other methods. A construction inspector is capable to monitor a large volume grading operation. The US Nuclear Regulatory Commission (NRC) and the US Department of Transportation (DOT) regulates the possession, use, and transportation of portable nuclear gauges. MoDOT’s Radiation Safety Officer from the Construction and Materials Division manages oversight of our radiation safety program. MoDOT’s program is extensive and in order to ensure compliance, Assistant Radiation Safety Officers are designated by MoDOT's Radiation Safety Officer to help with the program’s requirements and oversight. The NRC requires every nuclear gauge to be inventoried and wipe tested at six month intervals. During an inspection a wipe test of the source is performed and the gauge is checked for radiation levels. When this testing is performed, arrangements are made with the project offices to set up a time for the inventory/wipe tests. It is important to have the gauges at the time and place requested. An annual audit of the department’s radiation safety program is also required. MoDOT’s Radiation Safety Officer or an assistant will schedule these reviews. MoDOT’s material license, NRC, and DOT requirements, in addition to Operator Manuals, Emergency Procedures, maintenance guides, gauge inventory, wipe analysis, employee-training records can be found on at http://wwwi/intranet/cm/radiation_management/. Employees who transport or use nuclear gauges must undergo training at least once every three years. Since resident engineers are responsible for the nuclear program in their office annual radiation safety training will be provided. The Radiation Safety Officer and the district and headquarter assistants receive annual training in emergency response. Employees must be mindful of radiation safety at all times. Adherence of ALARA (As Low As Reasonable Attainable) principles must be exercised. Eating and smoking is prohibited in the proximity where gauges are stored, maintained or used. Dosimetry Gauge operators are not required to carry a TLD, dosimetry monitoring is optional since MoDOT is able to provide documentation demonstrating that unmonitored individuals are not likely to exceed 10 percent of the applicable limits. However, though the levels are well within the permissible limits, monitoring for employees who regularly use the gauges and provide oversight is provided with a Direct-Reading dosimeter (pic). A Direct-Reading dosimeter is a pocketsize, carbon fiber electroscope with an iron chamber for detecting and indication of integrated exposure to gamma and x-ray. Dosimeter instructions are located at http://wwwi/intranet/cm/radiation_management/. MoDOT’s licensed repairmen and employees who declare their pregnancy are provided with Thermo Luminescent Dosimeters (TLD). TLDs are sensitive to radiation and when it is developed the amount of radiation exposure can be determined. The TLD is not transferable and must remain with the individual operator. TLDs are replaced on a quarterly basis. Old TLDs are forwarded to the District Assistant Radiation Safety Officer at: Central Laboratory, Radiation Management Office, Room 160A, 1617 Missouri Blvd Jefferson City, Mo. 65109. MoDOT's NRC materials license permits storage of the nuclear gauges in the project office; a building adjacent to the project office or other MoDOT facility. A radiation exposure survey must have been made on any office gauge storage area and must be on file in the project office NRC file. A radiation placard is affixed to the doors of interior storage areas. A NCR Form 3 may be placed below the radiation placard or on the project office or testing laboratory bulletin board. If a gauge is to be stored for an appreciable period of time, it should be secured in an area at least 15 feet from any work area. Only those personnel with a current training card in their possession will be allowed to use or transport nuclear gauges. The storage facility or vehicle is to be locked at all times when no employees are present. NEVER LEAVE A NUCLEAR GAUGE UNATTENDED if it is not properly secured. Transportation of nuclear gauges is regulated by the U.S. Department of Transportation. Only those personnel that are nuclear gauge operators or those technicians or supervisory personnel who have satisfactorily completed their radiation safety training and have in their possession a current training card will be allowed to use or transport nuclear gauges. When performing tests in the field, always lock the gauge handle and return it to the transportation case before moving to another test site. When a nuclear gauge is transported, it may be transported in the trunk of a passenger car or locked in a metal transportation box bolted securely to a pickup truck bed near the tailgate. On a non-routine basis, a heavy chain may be used to secure a gauge to the bed of a pickup. If a chain is necessary to transport the gauge, the chain must be placed through both handles of the gauge's shipping case and locked to the bed of the vehicle. All slack from the chain must be removed. Chaining a gauge in the back of a truck is intended only as a temporary measure and must not be done on a routine basis. Regulations require the Bill of Lading be visible through the window of the transportation packet. The transportation packet consists of "Transportation Information" (Bill of Lading), "Troxler Nuclear Gauge Emergency Response Information" and "Emergency Procedures for Damaged Gauges". While in transportation, the transportation packet must be placed within arms reach of the driver wearing a seatbelt. If the gauge operator is not in the vehicle the bill of lading must be placed on the drivers seat or drivers side door pouch if gauge in the vehicle. This ruling applies at all times, whether the gauge is being transported in a vehicle to and from the job site or is being transported to and from the headquarters garage. If a nuclear gauge is damaged or stolen, follow the "Emergency Procedures for Damaged Gauges" in the transportation packet. Gauge users must have a current training card in their possession to transport or operate a nuclear gauge. Along with a radiation safety training card gauge users must have a current Operations Level 2 Technicians Training card. Refer to the instruction manual furnished with each instrument for operation instructions. Gauge models 3430 and 3440 Operator and Instruction Manuals may be down loaded from the Troxler Labs web site located at http://www.troxlerlabs.com. Employees are allowed to perform routine maintenance with the gauges. Examples or routine maintenance are: replacing batteries and scraper rings, and lubricating and cleaning the sliding block cavity. If the gauge is being used to test low-slump concrete, it is imperative the concrete be cleaned from the machine after each use. It is very important to practice ALARA principles when performing routine maintenance. At no time, can an employee remove the probe from the gauge. Non-routine maintenance is to be performed only by certified, licensed repairmen. If you have any questions regarding a question of routine maintenance, call Roger Wilson, (573) 751-5081. Routine maintenance procedures are found in the users manual and at http://wwwi/intranet/cm/radiation_management/. If a density test shows results slightly below minimum requirements, it is desirable to retest the lift in question after additional compactive effort. If original test results are more than two percentage points below minimum requirements, a retest is mandatory. Otherwise, if a retest is impractical, compactive effort must be continued until the inspector is satisfied that proper density has been obtained. Records and reports must show what action was taken after any unsatisfactory test. It is preferred that at least one density test be made at each structure (pipe culvert, box culvert, bridge) during backfilling operations. This may not always be possible or practical, but it must be kept in mind that as many tests as possible should be made during backfilling of structures to assure adequate densities at these very critical locations. When tests are not specified as a basis for determining acceptability of earthwork compaction, the inspector must use experience and judgment to determine when satisfactory compaction is being obtained. Certain equipment will be specified. It should be inspected before use. Information about the equipment and its use should be made a part of job records by notes in the inspector's diary. If the contract contains no provision for compaction, the only compaction required will be that obtained by distributing equipment movements over the entire fill area, and the inspector can require no other compactive effort. Ninety percent compaction is required for backfilled and compaction in cut areas unless the fill is within 18” of the roadway surface and roadway embankments, except in non-roadway areas of surcharged embankments, excess or unsuitable material, berms, old channels, or waste areas. Ninety-five percent compaction is required for the top 18” of a roadway fill, fills within 100 feet of a bridge or deck that is to used as a riding surface and for deep fills. 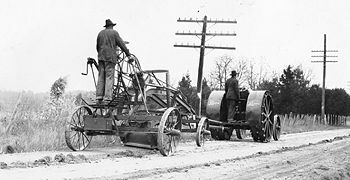 Compaction is performed by distributing equipment across a roadway approach with aggregate surfacing, and with 4 passes of a tamping roller or by 2 passes with a vibratory roller for rocky fills. The success of compaction operations depends extensively on proper moisture control. Optimum moisture, as determined by the standard compaction test, is an excellent guide to the moisture content at which soils should be compacted. Sec 203 establishes moisture content limits for some soils. Often contracts contain specific moisture controls as a requirement. Moisture tests taken to control embankment construction should be made during the placing of embankment material. If the tests are made for subgrade control, they should be made immediately prior to placing the base material. The area that must support the embankment should be carefully inspected. The presence of soft or very wet conditions may suggest; the need to remove unsuitable materials, the need to install underdrain facilities to remove spring or seepage water, or merely the need to aerate and dry materials that have become saturated due to poor surface drainage. If swamp, marsh, old lakebeds, etc., are within the construction limits, these are normally considered during the design stage. If the contract fails to address such areas, the district soils & geology technologist should be consulted. All areas where embankment is to be placed are to be stripped (scalped) as specified in Sec 203.4.12. Compactive effort on rock embankments will normally consist of at least four complete coverages of each layer with a tamping type roller or two complete coverages of each layer with a vibratory roller. Roughness often appears in the base and surface course of a roadbed at the transition from sizeable excavation to sizeable embankment sections. This can result from lack of attention to embankment foundation preparation in these critical areas. This situation is similar to the junction of a sidehill excavation and its laterally adjacent embankment. Cut compaction is an item that involves both excavation and compaction. Cut compaction is performed in all Class A material areas and in all unclassified material areas that fit the description of Class A material, after removal of the roadway excavation material to the required section. To perform cut compaction, a plane 12 in. below the top of the proposed grading section is temporarily exposed. The material may be pushed to one side, or hauled out and later replaced, at the contractor's option. The exposed material to a depth of 6 in. is manipulated and compacted to not less than specified density. Material is replaced above this plane in layers not exceeding 8 inches, loose thickness, and compacted to required densities. Cut compaction shall be performed to an additional depth of 12 in. for 50 ft. on each side of the intersection of the natural ground and the top of the subgrade; then graded uniformly in 30 ft. to meet the depth requirements of Sec 203 (also see Figure 200.18). The existing ground for the full width between roadway slopes under embankments of less than 18 in. tall shall be treated in accordance with Sec 203.5.8. The excavation shall be carried to only such depth as to insure having 18 in. of material of the required density and moisture below the top of the finished subgrade. When tests are not specified as a basis for determining acceptability of earthwork compaction, the inspector must use experience and judgment to determine when satisfactory compaction is being obtained. The contractor’s equipment should be made a part of job records by notes in the inspector's diary. If the contract contains no provision for compaction, the only compaction required is that obtained by distributing equipment movements over the entire fill area. Job records must be kept in such a manner that all partial and final payments can be easily and clearly supported by recorded data. This data should include when the work was completed, calculations or notes to support the quantity allowed, and the signature of the person who made the calculations and measurements. Records of quantities should be posted daily so that progress reports and payment estimates may be kept up-to-date. The inspector should obtain a daily load count from the contractor, or should estimate the amount of material moved during the day, to help the resident engineer determine quantities for weekly reports and payment estimates. Load counts are taken solely for the purpose of estimating the contractor’s production. Final payment cannot be made based on the contractor’s load counts. The contractor's daily load counts should be verified by the inspector by counting loads for a short time period and projecting a total for the day. This should be done once or twice a week. This estimated projection should be approximately equal to the total given by the contractor. These checks should be recorded in the inspector's diary. All estimated excavation quantities (that is, quantities that have not been computed) are to be measured and computed for final pay quantity. Any other changes outlined in the standard specifications are to be documented and computed for final payment. Excavation is measured and payment is made on a volume basis, usually per cubic yard. When field measurements are required, the usual method is to take cross sections at intervals where breaks in the terrain occur. This method for taking cross sections is explained in EPG 238.4.15 Pre-construction cross-sections. By use of original and final cross sections an area is computed at each station where a section was taken. By multiplying the average area of two consecutive sections by the distance between sections, the volume between sections can be computed. Plan quantities are normally used for final payment for Class A and Unclassified Excavation unless ground elevations shown on the plans are found to be incorrect. Actual ground elevations are considered to agree with those shown on the plans if the average elevation of the section does not vary from that shown on the plans by more than one foot. Occasionally, a project will run short of excavated material to complete the embankment. If the contract indicated excavation on the project was sufficient to complete the project but did not, additional compensation may be due to allow for acquisition of borrow and possibly for additional hauling required to complete the grade. Provisions of Sec 104.3 should be followed. Payment will be made for the entire volume of materials handled and compacted, including the 6 inch layer compacted in place, as compacting in cuts. This includes removal and replacement of material above the exposed 6-inch plane. In any event, payment for excavation is not a separate item but is included in the cost of compacting in cut. The plans show the disposition of all existing facilities and structures within right of way limits, including buildings, bridges, drainage structures, foundations, sidewalks and existing surfaces. The standard specifications provide that all materials removed under construction contracts, except guardrail, become the property of the contractor, unless otherwise specified in the contract. The item for the removal of bridges is applicable to the removal of drainage structures with spans exceeding 20 ft. and other major structures, such as large retaining walls. The plans include a complete description, with dimensions, of the items to be removed under this specification. If the material resulting from the removal of these large structures is to be hauled and stored on maintenance lots, the plans provide a lump sum item for hauling materials to storage (see EPG 203.2.1.3 Salvage Materials). and existing improvements in excavation limits for Class 3 or Class 4 Excavation. It should be noted, that Class 3 or 4 excavation does not include removal of existing headwalls, culvert concrete or roadway culverts. These items should be handled as removal of improvements for roadway culverts or partial removal of culvert concrete for bridge culverts. The designer uses the tabulation of removal items to prepare an intelligent estimate of each item from which an estimated lump sum cost can be prepared. Plans may designate removals or salvaged materials from improvements. Salvaged materials may not be stored permanently on the right of way. The FHWA will not participate in hauling removed improvements to stockpile sites. It is not required to give salvage credits for minor items such as base, surfacing and culvert pipe on temporary bypasses. If it is determined that these minor items would be useful to the state, federal funds can participate in the cost of salvaging, if the cost does not exceed cost of new material and if work is limited to the setting aside (not stockpiling) of the materials on the right of way, beyond construction limits. The cost of salvaging materials by the contractor, stockpiling and/or delivery to a storage site cannot receive federal participation and requires identification by separate bid items to make costs non-participating. The benefit of salvaged materials is generally questionable unless it is a major item. If any major materials are salvaged by the contractor, not used on the project, and retained for use by the state, it will be necessary to give salvage credit if federal funds are involved. Examples of major items are traffic signals, guardrail, and large culvert structures. Salvaged bridge materials may become the property of the contractor as specified in the standard specifications or may, by special provision, be retained by the commission without the necessity of giving salvage credit. The special provisions should show what materials, except guardrail, are to be salvaged, if any, and should state the disposition to be made of the materials. The standard specifications state that guardrail materials remain the property of the Commission and shall be stored on the right of way as directed by the engineer. A salvage credit value should be established for all salvaged materials, if practicable, at the P.S.& E. stage. The engineer can establish the value upon removal of the item, if it is anticipated that such value will be dependent upon the condition of the item after its removal. Salvage credit should be shown on the engineer's estimate. The plans include a description of all known existing items to be removed. The items to be removed are noted on the plans by the letter "R". A tabulation of all known removal items is also included on the Summary of Quantities 2B sheet. The removal items are listed in the order of occurrence insofar as practicable, designated by sheet number, station, location left or right with distance and a description. A total of the individual items is not indicated, as this is a lump sum item. Items to be left in place are noted "UIP" if they are to be used, and "LIP" if they are left in place and not used. Examples are shown in Sample Plans. Plans for all projects should be prepared to reuse material where the construction sequence will permit and where the cost of salvaging does not exceed the cost of new material. Clearing and grubbing is estimated during the design field check, and in conjunction with aerial photographs if available, consistent with the method of measurement given in the standard specifications. The standard specifications establish the size of trees and stumps that qualify for payment as clearing and grubbing. Roadways designed with clear zones are cleared at least to the minimum clear zone width. Use other roadway exceptions to decrease the cost of roadside maintenance and to improve the appearance of the completed facility. Clearing is excepted at the top of deep cuts, the bottom of high fills, in areas not conveniently accessible to maintenance equipment, in areas where the natural growth of trees and shrubbery will blend with adjacent areas, and at all other locations where natural trees and shrubbery will improve the appearance without detracting from the service of the completed facility. Clearing exceptions can be used to control erosion at interception and roadway ditch outlets. Areas that are not to be cleared are outlined on the plans and noted as "No Clearing" or "N. C." (see Sample Plans). This area should provide sufficient clearance for equipment to construct items such as interception ditches and levees at the top of backslopes or at the bottom of fillslopes. When the entire surface of the right of way is not to be cleared, the following general note is included on the first plan-profile sheet: "Areas noted 'No Clearing' or 'N. C.' on the plans are not to be cleared of trees, undergrowth, brush, grass, weeds or natural rock formations". The clearing and grubbing quantity is estimated, and pay items in acres are included. The quantity of acres should be placed on the Summary of Quantities 2B sheet. Grading quantities are computed on the basis of either a volume or linear unit of measurement. Volume grading is classified in accordance with the various grading items defined in the standard specifications. Unclassified excavation is not specified, except in special cases and where prior approval from the district’s soil and geology technologist has been obtained. Class C excavation consists of the removal of stone, including sandstone and igneous rock, as described in Sec 203 of the standard specifications. The standard specifications classify linear grading as Linear Grading, Class 1 and Linear Grading, Class 2. Other items measured on a linear basis are Subgrading and Shouldering, Class 1 and Subgrading and Shouldering, Class 2; and Shaping Slopes, Class I and Slopes, Class II. The cost of fuel greatly affects grading prices. A $1/gallon difference in fuel prices can result in an approximate $0.25/cy difference in the price of Class A Excavation or an approximate $0.40/cy difference in price of Class C Excavation for a haul distance of 2000 feet or less. The price of Unclassified Excavation will fall somewhere in between depending on the amount of Class C material. A history of fuel prices that is useful when estimating grading costs is available. For additional information see EPG 237.6 Estimates. The designer should consider the average haul distance and whether the equipment required will be on- or off-road. On-road trucks or long hauls will result in lower production rates and therefore, higher costs. When balancing earthwork it is useful to note that a haul distance over 1 mile in length, on- or off-road, may need further analysis to produce an earthwork balance that is cost-effective. Excess excavation can cost as much as borrow. It must be hauled somwhere! For projects containing Unclassified Excavation, ensure the job used for price history contains similiar geologic features. The price of Unclassified Excavation directly relates to the percentage of rock in the excavation and must be estimated as such. Price histories for Class A and Class C excavation are to be used with the assumed amount of rock to find the most representative price. Generally, operations for rock excavation result in prices that are 2.5 to 3 times higher than soil excavation prices for short hauls (i.e., 2000 feet of less). Example: 100,000 yards unclassified, assume 70% rock. Volume grading quantities are shown on the plans, divided into the various items. Volume grading quantities may be determined by the computer or manually. Methods for processing grading quantities are computed manually by plotting cross sections and templates and manually measuring and computing by the use of the double end area method. The computer is used to compute grading quantities whenever practicable, and depending upon the extent of the volume grading. Grading quantities computed by the computer are supplemented with incidental quantities that are usually computed manually. Volume grading is used for grading all roadways that are to be compacted. Where the standard grading template is in rock, partially in rock, or in unsuitable material, the grading template is undergraded below the bottom of the surface or base courses in accordance with the standard specifications and standard plans to provide a uniform foundation. The station limits for undergrading are shown on the profile portion of the plan profile sheets. The elevation shown on the cross sections should account for the necessary undergrading. The undergrading quantities are included in the classified excavation quantities shown on the plan profile sheets. Where unsuitable material is not to be used in the roadway balance, caution is exercised to insure that a sufficient quantity of material is included in the plans to complete backfill of undergraded areas and all other required fills. Details are shown on Standard Plan 203.02 Undergrading. Additional information can be found in Soil Characteristics. Most borrow and excess material areas are “contractor furnished” with the contractor responsible for attainment or disposal of the necessary materials and compliance with all environmental responsibilities. The borrow material will be designated on the plans as Class A excavation (borrow) and included in the bid item for Class A excavation. For those projects where suitable borrow areas cannot be secured or for projects which involve small quantities of borrow material (i.e., less than 100,000 cubic yards, such as bridge replacements, intersection geometric revisions, 4R interstate projects, urban projects, and other similar projects, it is acceptable to use contractor furnished borrow material which will be designated on the plans, quantified and paid for as embankment in place. All requirements of Section 4 (f) of the Department of Transportation Act and Section 106 of the Natural Historic Presentation Act will apply to all borrow areas. A written request for environmental services should be submitted to the Design Division determine if commission furnished borrow areas are suitable for use. If the contractor elects to use another site, rather than the site furnished by the commission, the contractor must provide written certification to the resident engineer that the proposed borrow site is cleared of environmental concerns under all applicable federal and state laws and regulations. These include but are not limited to the following: Clean Water Act; the Endangered Species Act; the National Historic Preservation Act; the Farmland Protection Act; Resource Conservation and Recovery Act; Comprehensive Environmental Response; Compensation and Liability Act; and RSMo Chapter 194, (see Section 194.400), Unmarked Human Burial Sites. Certification shall include clearance letters and other evidence of coordination with the appropriate regulatory agencies, as attachments. The contractor shall reimburse the Commission for any reduced or eliminated FHWA participation due to not meeting any of the regulations. If the appropriate quantity of material is available from several sources on a project that specifies contractor furnished borrow materials, the contractor is required to designate the specific source from which the materials are to be obtained. The contractor is required to clear the borrow areas for environmental concerns, unless the source is a quarry or other locations where the necessary clearance has already been obtained. The contractor provides documentation that the borrow areas are clear of environmental concerns. Contractor furnished borrow material is designated on the plans as embankment in place. Roadway slopes and pavement design for a project specifying embankment in place will be based on the most probable soil in the area. The district is responsible for furnishing this information prior to slope and pavement design. In most cases it will be necessary to prepare a special provision establishing certain minimum soil characteristics to guarantee the quality of the material used. Commission furnished borrow areas will be located out of sight of the traveled way, if at all practical. If it is not practical to locate it out of sight, the borrow areas are to be graded and dressed so their appearance is aesthetically pleasing. The following note is placed on the right of way plans for Commission furnished borrow areas. "The design grade established for this borrow area is approximate. During the construction phase of the project, it may be revised as necessary to provide the proper quantity of fill material to complete the roadway grading". Cross sections are taken and a design grade established on all commission furnished borrow areas. The cross sections are made a part of the detail design plans. The plans may indicate suggested disposal sites for excess material but do not specify mandatory disposal sites unless such mandatory sites are justified economically with respect to a particular federal-aid project or a combination of federal-aid projects. The FHWA may concur in and may approve the designation of a mandatory site based solely on environmental considerations, provided the environment would thereby be substantially enhanced without excessive cost. The specifying of a mandatory disposal site is rare, and in most instances, the contractor is given the option on the disposal site. This does not prohibit the specifying of disposal sites on state-financed projects. Borrow, embankment in place, and excess material quantities are clearly indicated in the grading quantities on the plans. Where the plans provide more than one borrow or excess area, the plans clearly indicate which areas are used in specific balances, and specify the approximate quantities involved. Costs of borrow easements obtained on right of way projects are not accountable as a right of way item. Such costs are charged to the construction of the project. The plans show balance points, a zero point on the mass diagram, to the nearest 1 ft. The location is determined by accumulatively subtracting excavation from the adjusted (shrunk or swelled) fill until the point of zero quantity of fill or cut is reached. The length of a balance is not limited; however, where possible the profile grades are adjusted to minimize overhaul quantities. Excavation division points or balance points are shown at the ends of span type bridges to define the fill exception and to provide the contractor with the volume of material to be hauled across the bridged location. The ratio of the quantity of excavated material to the quantity of embankment that can be constructed from the same material is the shrinkage or swell factor of the material being excavated. The shrinkage factor given in the preliminary geotechnical report is generally not acceptable for use in balancing roadway excavation because of excess in scalping, grubbing, and material losses during grading and hauling operations, but is used as a guide. Shrinkage factors for earth excavation will vary from approximately 140 percent in light grading to approximately 105 percent in heavy grading. Shales and rock excavation are usually arbitrarily swelled approximately 10 to 25 percent, depending on the quantity and type of rock. The higher percentage is used where the percentage of rock to total excavation is high. The swell factor also partially accounts for overbreak. Shrinkage and swell factors are usually determined for each improvement on the basis of previous experience with grading operations in the same area, or in a similar area, and is largely a matter of good engineering judgment aided by the preliminary geotechnical report and all other available data. When selecting shrinkage and swell factors, the district geologist or geotechnical specialist should be consulted for input. These factors are not shown on the plans. Overbreak resulting from blasting rock below the limits of undergrading shall be removed and backfilled with spalls or rock fragments at the contractor's expense. Therefore, do not include overbreak in the classified excavation quantities. The overbreak within the roadbed limits is backfilled and does not materially influence the swell factor for the classified excavation, unless backfilled with other than roadway excavation. There is no direct payment for overhaul. For estimation purposes, consideration should be given to haul distances greater than 2,000 feet and/or material that cannot be handled with off-road equipment. The existence of either one of these conditions may result in decreased production rates and increased costs. The preliminary geotechnical report may specify certain embankment to be constructed with rock or shale in the lower portion of a fill. In such cases, and when earth is to be used for backfilling undergraded cuts or for shouldering, it is sometimes necessary to stockpile earth excavation to accomplish this result. Sometimes material for these uses can be obtained from adjacent balances without stockpiling material. Stockpiling of excavation is provided for on the plans in those cases where the material necessary for these uses cannot be obtained elsewhere without undue inconvenience and expense. The payment for handling stockpiled excavation is at the rate for the applicable item of Class A excavation or unclassified excavation for each handling. It is sometimes desirable to place additional loads on fills in areas with poor fill foundations to accelerate settlement. This loading is usually accomplished by constructing the fill to a specified height above grade, which is called surcharging the fill. The Construction and Materials Division, Geotechnical Section performs an analysis of the fill foundation to determine the depth of the required surcharging and the length of time it should be in place for the fill to fully consolidate. The Geotechnical Section will also recommend number, location and type of pore pressure and embankment control measuring devices and necessary drains. Surcharging is usually left on fills for a period of at least 90 days. The portion of the fill surcharge, to the depth of anticipated settlement, is compacted in accordance with compaction requirements for other fills. The surcharge above this elevation is not compacted. The surcharge is usually sloped on 1:1 slopes above grade. When anticipated settlements are significant, the grade slopes may be made steeper as required to obtain a finished roadway slope and roadbed width after settlement. If the surcharge is to be left on the fill for an extended period of time that will cause undue delay to the contractor, separate grading and paving projects may be considered. In such cases, the Construction and Materials Division is advised of the date that the surcharge was placed at the time the paving plans are submitted. Removal of surcharge material is paid for as Class A excavation. Existing roadways beyond construction limits which are to be abandoned, and temporary roadways which do not become a part of the completed facility, are obliterated to at least the new right of way limits and to beyond the new right of way limits as required to improve appearance. Payment for removal of concrete pavement should be listed as “Removal of Improvements” on the plans for the obliteration. The removal of any bituminous pavement will be covered by the grading pay item used. Appropriate volume grading units are to be used for the obliteration. The quantities for the obliteration are noted and kept separate from the main roadway grading quantities or may be used in balancing the earthwork quantities in the job, provided the material is used within the shoulder embankment and is not greater than 24 inches in size. All residual asphalt pavement must be covered from exposure and reinforced concrete rubble should not have protruding reinforcement. Linear grading should be used in special circumstances, such as median crossovers and connections to driveways for the obliteration where the grading quantities are within the limits of linear grading. A job special provision should be written to specify the contractor’s responsibilities for the job. See EPG 214 Rock Fill. Quantities for incidental grading for such items as entrances, ditch blocks, inlet and outlet ditches, levees, etc., are included in the grading quantities shown on the plans. An arbitrary quantity of Class A excavation amounting to 500 yd3/mile is added to the tabulation of volume grading quantities for rounding. The plans show complete quantities and other grading information (see Sample Plans). The plans show grading quantities by classification. The Class A excavation is further divided into roadway, borrow, channel change, roadway obliteration, etc. All Class A excavation is considered as one item in the estimate and in the contract. Care is exercised to insure that the grading quantities indicated on the plans are accurate and complete, since plan quantities are the basis of final payment, with certain exceptions. On projects where the roadway grading and mainline paving are constructed with individual contracts, the subgrade elevation for the grading template should be designed and built 0.1 ft. high. This provides the paving contractor the necessary thickness for fine grading operations prior to paving, and excess material for backfilling shoulders and dressing slopes. The appropriate use of Type B Berms and Slope Drains is described in EPG 806 Pollution, Erosion and Sediment Control. Temporary shoring may be necessary where grade differences are encountered during construction and there is not adequate R/W to build a stable slope. These areas may include differing grades for bridge construction or MSE wall excavation, which will be indicated in the bridge memorandum, or raising the grade of a relocated roadway and other stage construction. The need for temporary shoring will be dependent upon the recommended slope found in the preliminary geotechnical report. Temporary shoring pay item should only be used when temporary shoring is needed in a specific location and not as a precautionary measure. The district geologist or geotechnical specialist and district construction and materials personnel should be involved in the decision to include temporary shoring in a contract. Contractors may opt to use different construction methods that may require more or less shoring than estimated by MoDOT. Temporary shoring is paid for as a lump sum item to avoid disputes over the exact quantity needed. Designers should estimate the surface area that will be needed in square feet and indicate this area on the Summary of Quantities 2B sheet with a note “For Information Purposes Only”. The linear unit for measuring roadway excavation quantities is used when grading is expected to be minimal. Linear grading can be used on plans for all systems, however linear grading should not be used for roadways built with a constructed base. For information see EPG 207.1 Class 1 Linear Grading. For information see EPG 207.2 Class 2 Linear Grading. For information see EPG 207.3 Approaches. For information see EPG 207.4 Classified Excavation. For information see EPG 207.5 Inlet and Outlet Ditches. For information see EPG 207.6 Plans. This grading item is required for preparing a subgrade upon which a base course is to be constructed or a surfacing placed. No direct payment is made for this item and it is equally applicable for combination grading and paving projects, and for paving projects on a previously graded improvement. This item is used to loosen the surface and to remove oversize rock from the roadbed. The plans show the locations to be scarified and the quantities are indicated on the plans in accordance with the units specified in the standard specifications. This item is intended for use primarily where an aggregate surfaced travel way is provided. Although this item is provided in the contract, it is performed only by written order of the engineer during construction. This grading item is used to insure an adequate subgrade for placement of a base or pavement and is used only in paving contracts on improvements that have been previously graded. Subgrade compaction 6 in. depth is provided in the paving contract for the full length of earth subgrade including cuts and fills. Although this item is provided in the contract, it is performed only by written order of the engineer during construction. This work consists of preparing the earth subgrade for the surfacing and shoulders by fine-grading, and shaping the existing roadbed of a previously graded roadway, and shaping fillslope, foreslope, and ditches as required to complete a finished roadway conforming to the typical section. This item is not described in the Standard Specifications. For grading and shaping existing shoulders for resurfacing and widening, and widening shoulders beyond the prevailing width of the roadbed, volume grading should be used. If the work is minor in scope, Linear Grading, Class 1 may be used or the grading may be considered incidental to the other pay items. The shoulder to be constructed is shown on the typical section. If ditch work is contemplated in connection with the work of shaping shoulders, the required ditch typical section must be shown on the plans. Shouldering by maintenance forces on resurfacing projects will not be permitted. Shaping shoulders generally involves relatively small quantities of excavation or fill, which results in an exceptionally high shrinkage factor. A shrinkage factor of 200 percent or more is not uncommon in estimating the volume of material required. Linear Grading, Class 1 may be used for those work locations where an aggregate shoulder is to be provided and where only a very minimum of shoulder work is necessary. For those areas, the only work necessary would be that of mowing the existing shoulder, scalping existing vegetation, or such minimal grading to prepare for the placing and compacting of the aggregate. The method of measurement and payment of aggregate base specified for the shoulder will be made to the nearest square yard of aggregate material placed on the shoulder. This item is used for grading and shaping slopes on resurfacing projects where stabilized shoulders exist and the resurfacing includes the shoulder. This item is not intended for major reconstruction of slopes, ditches, or shoulders. The shaping is to eliminate the abrupt drop-off at the shoulder edge resulting from the resurfacing, and to dress up the slopes from an appearance and safety viewpoint. A separate measurement is made of each side measured along the centerline of the travel way. Shaping Slopes, Class I is specified on the plans where the material required to bring the roadway to the designated cross section can be obtained or disposed of within an approximate distance of 1000 feet on the right of way. Shaping Slopes, Class II is specified where it may be necessary to haul outside the limits of Shaping Slopes, Class 1 or where it is necessary to go outside the limits of the right of way for additional material to construct the slopes to the designated cross section or to dispose of excess material outside the limits of the right of way. Contract quantities are used for payment thus requiring careful consideration of the specified type and accurate indicating of the respective type on the plans. All quantities of linear grading and other grading items with linear measurements are indicated on the plans in units consistent with the units of measurement specified in the standard specifications. Examples are shown in Sample Plans. Compaction of embankments without specified compaction results or equipment. Backfill placed in undergrading areas is compacted while that placed in over-break areas is not compacted. Embankments constructed of rocky embankment materials. Any portion of an embankment below an elevation 50 ft beneath the top of the finished subgrade. All material placed in accordance with Section 203.3 of the standard specifications is included in the measurement of compacting embankment, including Class C excavation and unclassified excavation. Compacting embankment also includes the compacting of the backfill in undergraded cuts. Rock fill for embankment protection, Section 214 of the standard specifications, is not included in the measurement of compacting embankment. Roadways requiring a processing aggregate surface treatment shall be compacted not requiring moisture and density control and shall be specified in the contract to be compacted in accordance with Section 203.4 of the standard specifications. No direct payment will be made for compaction under this specification. When no compaction is designated by the contract, no compaction will be required other than that obtained by distributing equipment movements over the entire fill area. Compaction for berms, filling old channels outside roadway limits, excess or similar areas, and for any roadway or approach for which a granular type surface is proposed will require this method of obtaining compaction. The plans do not separate compaction quantities by required densities. The plans do show separate quantities for compacting in cut and compacting embankment. The plans should include quantities for compaction of material used to replace undergrading and overbreak areas within the roadway limits. The contract must designate which roadways are to receive which type of compaction when more than one type is involved on a given project. Levees shall not be constructed by others on MHTC right of way unless approval has been specifically granted by the TR44 Levee Attachment Agreement approved by the Commission. Roadway embankments are not considered to be flood control structures (i.e. a levee) since their construction technique is not adequate for that function. Additional information is found in a September 10, 2008 FHWA Memorandum entitled Highway Embankments versus Levees & other Flood Control Structures. This page was last modified on 7 February 2019, at 11:27.